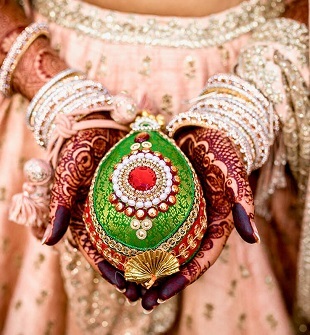 While red and gold are the traditional hues for an Indian bride, a little experimenting could give marvelous results. 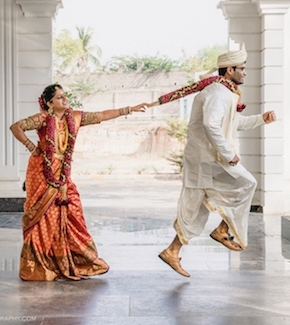 Every bride wants to look flawless on her wedding. The most important element that needs to shine through is obviously the wedding Lehenga. Colors are to play with and have fun with. It’s time to break the mainstream bridal lehenga palate and make a statement with your outfit on your wedding. Additionally, there are certain colors that are just made for different seasons! 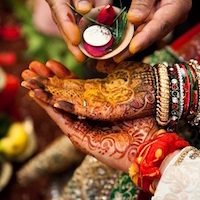 Here is your seasonal color guide for wedding lehenga. The winter months are attributed to dullness and laziness. One only wishes to cuddle up in their blanket all the time and never move. Therefore, to please the eyes in such a season the colors need to be sharp, dark and clear. Go BOLD! open up your winter palate to colors like steel blue, icy cobalt, hot pink, strawberry pink, fuchsia, ruby red, and emerald green. What to avoid: pastels, light colors, gold, orange or beige. If your wedding is in the winter months, it is your time to experiment with the winter colors and turn those heads around. Spring means blossoming flowers, popping colors everywhere and a new energy in the air. To equalize with that freshness in the air, if you are marrying in these two months of spring you have a wide range of colors to try on! Transition into the month of warmness with warm and comforting tones like an uplifting camel, magical corals, luscious limes, sun-kissed goldens and pleasing peaches. Avoid wearing dark and sharp shades if you want the picture perfect outfit. The final pick of the seasonal color guide for wedding lehenga finishes with Autumn symbolizing falling leaves from the tree, changing colors, and sceneries. It is a beautiful season and a great midway between summer to winter. It goes from drizzles to festive in no time and to celebrate this perfect autumn temperature, you need to play with tangerines, elegant oranges, subtle browns, rusty reds, olive greens, beige, and golds. Avoid colors like navy blue or too bright popping shades. Make your appearance priceless with the amazing autumn shades and be ready for a million compliments from your friends and family! Well, this was my take on the seasonal color guide for wedding lehenga or you can say my seasonal color palette for bridal wear. Some of the designs above are designed by Sabyasachi, Manish Malhotra, Ritu Kumar, Tarun Tahiliani, Abu Jani and Sandeep Khosla. Hope you find your color for the wedding lehengas this wedding season.